Karnataka: By-election to three Lok Sabha constituencies and two Assembly constituencies came to an end. Voting began at 7 am and came to an end at 6 pm. Counting of votes will take place on November 6. Among Lok Sabha constituencies, Shivamogga and Ballari recoreded more than 50% voter turnout, but there was disappointing representation from Mandya, that didn't even cross 50% voting. Among Assembly constituencies, Jamakhandi recorded over 70% voter turnout but Ramanagara barely crossed 50%. Even rain discouraged people in Ramanagara and Mandya, as it started pouring after 4 pm. 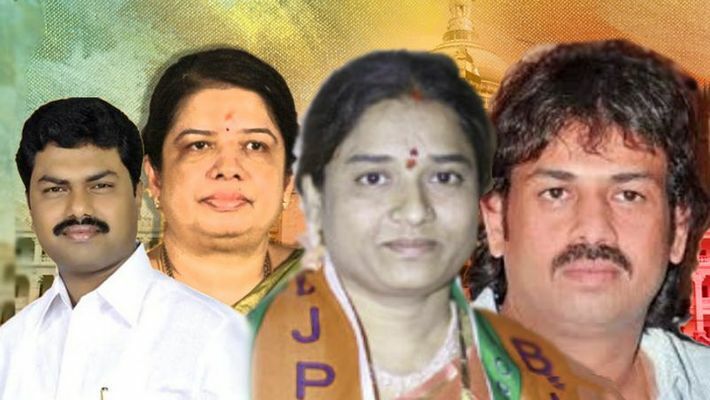 But before casting their votes, candidates including Anitha Kumaraswamy, BY Raghavendra, J Shantha and Madhu Bangarappa were seen paying a visit to temples, to seek divine intervention. A total of 54,54,275 voters are eligible to exercise their franchise in about 6,450 polling stations. There are a total 31 candidates in the fray in all the five constituencies, though the contest is mainly between the Congress-JD(S) combine and the BJP. At 5 PM, Lok Sabha bypoll constituencies Shivamogga recorded 55.16%, Ballari 57.65%, Mandya 48.83%, assembly constituencies Ramanagara secured 67.22% and Jamkhandi recorded 74.41% voter turnout. At 3 PM, Shivamogga has recorded 41.49%, Ballari 35.72%, Mandya 37.70% and assembly constituencies Ramanagara recorded 54.76% and Jamakhandi 58.82% voters turnout. At 1 PM, the voters turn out at Shivamogga, Ballari and Mandya is 30.20%, 35.72% and 26.80% respectively and 39.81% and 43.50% in Ramanagara and Jamakhandi constituencies. At 11 AM, the Lok Sabha constituencies of Shivamogga recorded 17.37%, Ballari 24.58% and Mandya recorded 13.36%, and assembly constituencies Ramanagara recorded 21.51% and Jamakhandi recorded 22.3% voters turn out. While the Lok Sabha constituencies of Shivamogga, Ballari and Mandya recorded 7.16 per cent, 4.4 per cent and 4.18 per cent voting respectively till 9 am, Ramanagara and Jamkhandi assembly constituencies have recorded 7.34 and 9 per cent polling. After quitting BJP, Ramanagara candidate Chandrashekhar not only joined Congress, but also stopped BJP agents from entering 277 polling booths. Chandrashekhar quit the party just two days before the Karnataka by-election. Though he is a Congress member now, his name is shown in the EVMs as BJP candidate, as he withdrew his nomination much after the last date to do so. Chandrashekhar also submitted Form 9 and announced that he has annulled Padmanabh's position as his chief election agent. Thus making sure that Padmanabh's signature on any election-related document becomes invalid with immediate effect.